(JNS) The hashtag #myfirstantisemiticexperience is helping to publicize the everyday reality of Jew-hatred. But it’s not clear if this is helping Jews think clearly about the subject. The testimonies of slights, hurtful comments or outright acts of intimidation – even violence – have come pouring in. And the result is that a lot of people are thinking more about their own experiences of anti-Semitism and what can be done about it. The avalanche of testimony about first encounters with anti-Semitism was the result of a tweet from Rabbi Zvi Solomons from Reading, England. The rabbi created the hashtag #myfirstantisemiticexperience on Twitter and then asked followers to respond. As is the pattern with such social-media events, as the original question and answers were tweeted and repeatedly retweeted, the interest in the idea grew and continued to pile up reactions. Most of the tweets are between 140- and 280-character-long expressions of pain or pride in the way parents stood up for children who were victimized. Many spoke of the shock and incomprehension of mindless hate. Others told of having made it to adulthood before coming face to face with prejudice. But taken as a whole, it is an impressive compendium of incidents that speaks of how bias against Jews can be found in all corners of society and walks of life. The context of Solomons’s query is the situation in Britain where anti-Semitism has become a major issue with the emergence of Jeremy Corbyn as head of the Labour Party. Corbyn’s animus against Israel and its supporters is more than just a matter of ideology. It has, as is always the case with anti-Zionist invective, not so much crossed the line between criticism of Israel and open anti-Semitism as it has erased it. A rising tide of anti-Semitism that often masquerades as only a critique of Israeli policies has swept from Asia and the Middle East all the way across Europe, and is now seeking a foothold in the United States. Old hatreds that were once expressed in private are now being said in public as both extremist right-wingers, and more fashionable and influential left-wing anti-Semites, no longer feel bound by societal taboos against such behavior. Along those lines, you can consider the hashtag an act of collective group therapy for Jews speaking out about their experiences and finding they are not alone. Indeed, one of the most remarkable aspects of the experiment has been to see how so many of the responses resemble one another. An introduction to anti-Semitism for most of us in this day and age isn’t a matter of being a witness to the horrors of Jewish history involving the shedding of innocent blood. Rather, most often it takes the form of insults or snubs that are the stuff of common sordid prejudice. This sharing can be healthy for those who are in some cases processing the hurt they experienced. It can also be deemed necessary in order to educate the public about the persistence of anti-Semitism, which is far more than just memories of the Holocaust or extraordinary atrocities like the Pittsburgh synagogue shooting. My own first experience came about when, as the only Jewish child in my local grade school, I was turned away from the door of a classmate’s house by his mother, who informed me that there was no more room for me at a birthday party (even though the whole class had been invited). When I walked away, I saw other kids being let in. The inescapable conclusion was that I was not welcome because I was the only Jew. But no one should shed any retrospective tears on my behalf. I was a shy child and actually felt relieved at being spared from having to attend a party for a classmate that wasn’t a particular friend. As a bonus, when I arrived back home and told my mother what happened, she let me keep the present she had bought for the birthday boy before she set off to give that other mother a tongue-lashing that I’m sure left a far greater impression on her than her meanness had on me. In our current culture, nothing is considered nobler than being a victim. Victim status confirms a kind of bogus legitimacy on anyone who can claim to have been wronged, regardless of the merits of the dispute or the context. 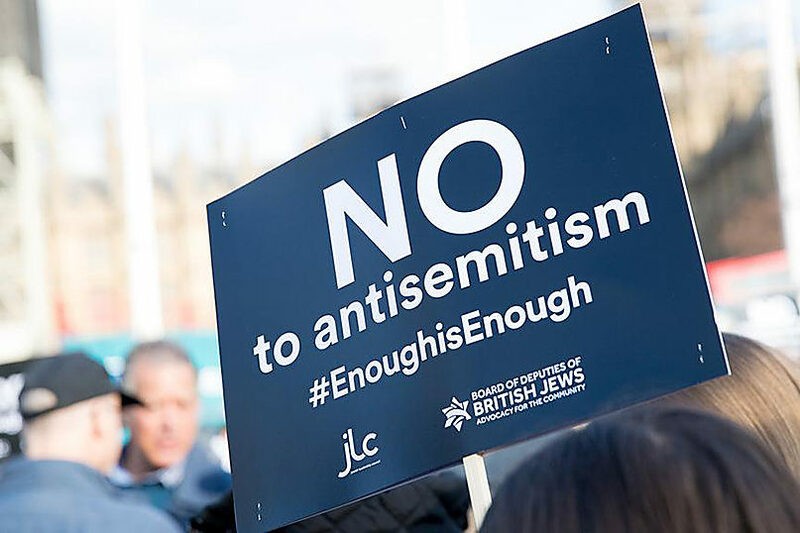 As much as Jews have been – and in some instances continue to be – victims of hate, it is vital that the Jewish community not view itself in that way. The most important lesson of modern Jewish history is that while Jews were persecuted for many centuries, we cannot allow that to become our identity. Jews are not a despised rootless and homeless people. We have instead – through the triumph of Zionism and the miracle of modern Western democracy, and especially the variant that exists in an exceptional United States of America where anti-Semitism has never been an official government policy – become actors on the stage of world history, rather than merely victims who must suffer the abuses of our enemies without recourse. Nor should the pain of the insults and hurts catalogued by this hashtag be compared to the horrors inflicted on Jews in the past during the Holocaust and countless lesser historical events. Even at a time when anti-Semitism is on the rise, instead of feeling sorry for ourselves, it’s important to think clearly about this scourge, as well as the need for a proud and far-from-defenseless Jewish people to speak up and resist our foes. Ours is far from the first generation to have to deal with this problem, and it won’t be the last. The best answer to anti-Semitism remains our ability to defend ourselves, whether through solidarity with Israel or making common causes with the vast majority of Americans who stand together against vile prejudice. Though many of us have been hurt, we aren’t victims anymore and should never again think that way about what it means to be a Jew. Jonathan S. Tobin is editor in chief of JNS–Jewish News Syndicate. Follow him on Twitter at: @jonathans_tobin.